J-Prime Steakhouse is well known as San Antonio’s, “Best New Restaurant”! This sets expectations high for all restaurant guests from the very first interaction. We created an e-mail campaign to keep their subscribers in the loop on weekly events, happy hour happenings, special events, or any news, all with the J-Prime touch. 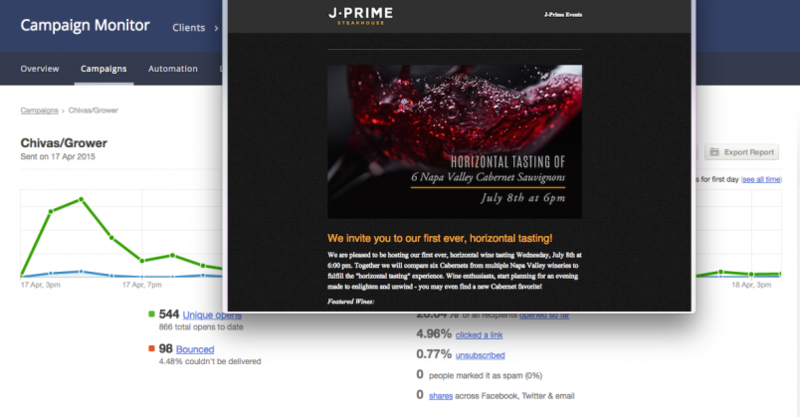 J-Prime’s e-mail subscribers have increased significantly in just the initial three months we had implemented the strategy. We averaged about 170 subscribers total and counting. Each e-mail includes a call-to-action link that ties to the J-Prime website making it extremely convenient for subscribers to access information instantly. Reservations were made throughout the week for various wine dinners, wine tastings, scotch tastings, and even the occasional wine class – reaching the events full capacity. The e-mail campaigns were a success as they averaged a 30.61% open rate and 12% click rate. Our customized HTML e-mail templates kept with the J-Prime brand – elegant and easy to read. These custom email templates also allow anyone to simply plug in the information for the news item or event. This allows each email to stay beautifully formatted and maximizes efficiency in delivering email campaigns quickly. To continue collecting email addresses from eager patrons, we implemented a simple email subscription form. This is a necessary tool to allow every visitor to the site know that they can stay up to date with J-Prime by simply providing their name and email address. This system automatically adds each name and email to an email list so that with every campaign, the latest subscribers receive an email. Email is a great opportunity for restaurants to keep themselves in front of their audience on a regular basis. With email campaigns averaging over a 30% open rate, getting guests in to the restaurant was a piece of cake… or should we say, steak?